Socially anxious Vincent has resigned himself to spending Thanksgiving alone this year, just him, the parade, and some pie. The last thing he expects is Cory, the handsome neighbor he's been daydreaming about, to knock on his door with a holiday crisis of his own. Vincent would love to help him, but he's afraid that the more time Cory spends with him, the sooner Vincent's anxiety will drive him away. What he doesn't realize is that Cory finds Vincent's gentle ways adorable and has been waiting for a chance to talk with him. Cory also firmly believes that a day like Thanksgiving should be spent with the people you want to be around--and he wants to be around Vincent. If that means pretending to need help in order to coax Vincent from his apartment, then Cory is willing to do it. The only potential hitch in the plan is Vincent himself. Can Vincent gather the courage to go after what he wants? 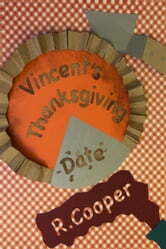 Or will he spend his Thanksgiving exactly as he planned, with only a pumpkin pie for company?